Caption caption slip reads: "Photographer: Mitchell. Date: 1958-07-08. Reporter: Reay, Bernstein. Assignment: Pay protest. 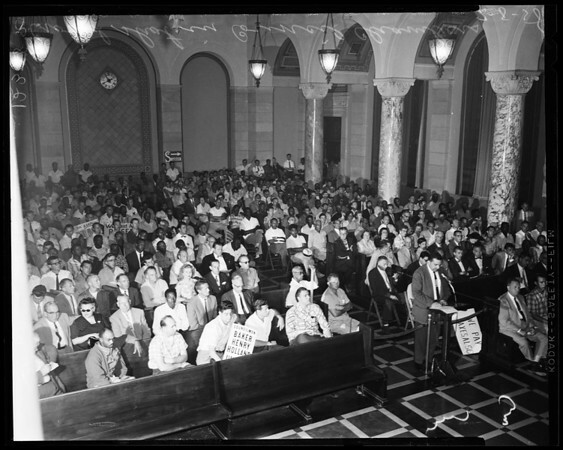 1/4/175: Crowd shot in City Council chamber, George E. Brown Jr. at mike. 176: Robert Egenes, president, All City Employees Association at mike. 13/14: Crowd at city hall steps and parade of people coming from 2nd and Bdwy. 23/24/105: Crowd on city hall steps".